^ Gandhi, Rajmohan (2006) pp. 1–3. Bondurant, Joan V. Conquest of Violence: The Gandhian Philosophy of Conflict. Princeton UP. 1988. ISBN 978-0-691-02281-9. Dutta, Krishna and Andrew Robinson. Rabindranath Tagore: An Anthology 1997. London: Picador/Macmillan. ISBN 978-0-330-34962-8. Gandhi, M.K. "Zionism and Antisemitism." The Gandhi Reader: A Sourcebook of His Life and Writings. Homer Jack (ed.) Grove Press, New York: 1956:317-322. ---"Questions on the Jews." 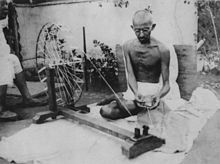 The Gandhi Reader: A Sourcebook of His Life and Writings. Homer Jack (ed.) Grove Press, New York: 1956:322-3. --- "Reply to Jewish Friends." The Gandhi Reader: A Sourcebook of His Life and Writings. Homer Jack (ed.) Grove Press, New York: 1956:323-4. --- "Jews and Palestine." The Gandhi Reader: A Sourcebook of His Life and Writings. Homer Jack (ed.) Grove Press, New York: 1956:324-6. 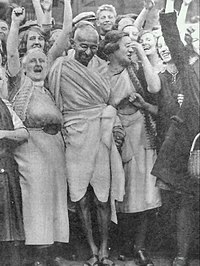 Gandhi, Rajmohan. Patel: A Life. Navajivan Publishing House. 1990. ISBN 978-81-7229-138-9. Sharp, Gene. Gandhi as a Political Strategist, with Essays on Ethics and Politics. Boston: Extending Horizon Books, 1979.